Celebrating the life of Harold Gipson, Sr.
Obituary for Harold Gipson, Sr.
On Saturday, October 27, 2018, Harold Gipson, Sr., husband of Tisbia DeLaine Gipson, exchanged time for eternity at his residence. Born on October 17, 1942, in Rimini, he was a son of the late James & Catherine Kennedy Gipson. Service of remembrance shall take place on Sunday, November 4, 2018, @ 12:30 pm from the Fleming & DeLaine Chapel, 222 West Boyce St., where Brother Edward Ross, Sr. shall deliver the discourse. The service of committal shall follow in the family plot located in the State Cemetery, Jordan. The family is receiving relatives and friends at the residence, 305 Oakland Ave., Manning. Fleming & DeLaine Funeral Home and Chapel of Manning is in charge of these services. 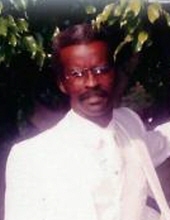 Online condolences for the family may be sent to www.flemingdelaine.com or flemingdelaine@aol.com. To send flowers or a remembrance gift to the family of Harold Gipson, Sr., please visit our Tribute Store. "Email Address" would like to share the life celebration of Harold Gipson, Sr.. Click on the "link" to go to share a favorite memory or leave a condolence message for the family.